Old Habits Die Hard: Don’t Turn Intuitive Eating Into the Hunger/Fullness Diet! About a year ago I got a ticket for running a stop sign. As you probably guessed, I was much more cautious when driving after that. Well, at least for a few days. Gradually, my old habits of rolling through stop signs and going a bit over the speed limit crept back into my routine.1 A few weeks later, I was processing my eating issues with my therapist when it hit me that the same thing was happening as I moved along in my intuitive eating journey. Old habits bring a sense of comforting familiarity and that sometimes causes us to take a step backwards. This was never more true than when I subconsciously tried to blend my dieting habits with intuitive eating. So, how did this all come about? Despite my skepticism of intuitive eating, I had a glimmer of hope and, dare I say, excitement when I read about it. The idea of breaking free from the cruel clutches of dieting and being at peace with food and my body was like seeing the first glimpse of blue sky after a storm. I just had to eat when I was hungry and stop when I was full. It seemed shockingly simple. A curveball was thrown my way though. One very powerful and alluring feature of dieting was its rules. I didn’t have to analyze what my body was telling me; the diet would dictate all aspects of my food consumption. As confining as it was, it also brought a sense of calmness. Without realizing it, I started turning intuitive eating into the hunger/fullness diet. Don’t overthink the hunger/fullness scale. The hunger/fullness scale can be a good reference, but some people make it rigid. That’s when it gets easy to overcomplicate things and turn intuitive eating into the hunger/fullness diet. I get it. It’s likely you’re a bit out of touch with your hunger and fullness cues since you’ve been ignoring them for so long. 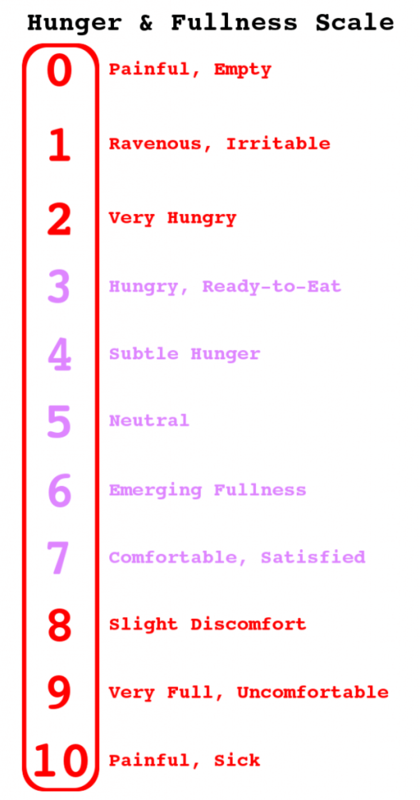 I know that I overthought my hunger and fullness at first because I had no idea what my body was telling me.4 Remember that the hunger/fullness scale is there to give you a general sense of when to start eating and when you might consider stopping. And if a 5-point scale is easier for you to wrap your brain around, then tweak it so it works for you! Intuitive eating is about flexibility. We are so used to rules because of dieting that making IE rule-based brings it into familiar territory. Some even want it to be a set of rules because trusting your body means having less control. The goal of intuitive eating is not perfection. Because we are not bound to the all-or-nothing thinking of perfectionism, we can go with the flow and be more flexible around food. Intuitive eating is a guideline. Long time dieters often see the IE principles as strict directives. In reality, they’re only a guideline.5 I believe that IE would have turned into the hunger/fullness diet for me if I had made it a hard and fast rule to only eat when hungry and to stop when full. For example, I now give myself permission to eat cake at a birthday party even when I’m not particularly hungry. Although I don’t want it to be the norm to eat past fullness, it’s not something that I freak out about if I do. Diet mentality is sneaky. Habits of dieting can make their way into other parts of intuitive eating as well. Eating mindfully is a common IE component that is sabotaged with diet mentality. It’s possible for mindful eating to become a food rule if we let it. While I enjoy mindful eating, but it’s not a must at every meal. I brought my desire for structure to intuitive eating and ended up extraordinarily close to making it into a diet which was something I was desperately trying to break free from. I realized that I had started to impose rigid rules on my eating, so I took steps to change my perspective. 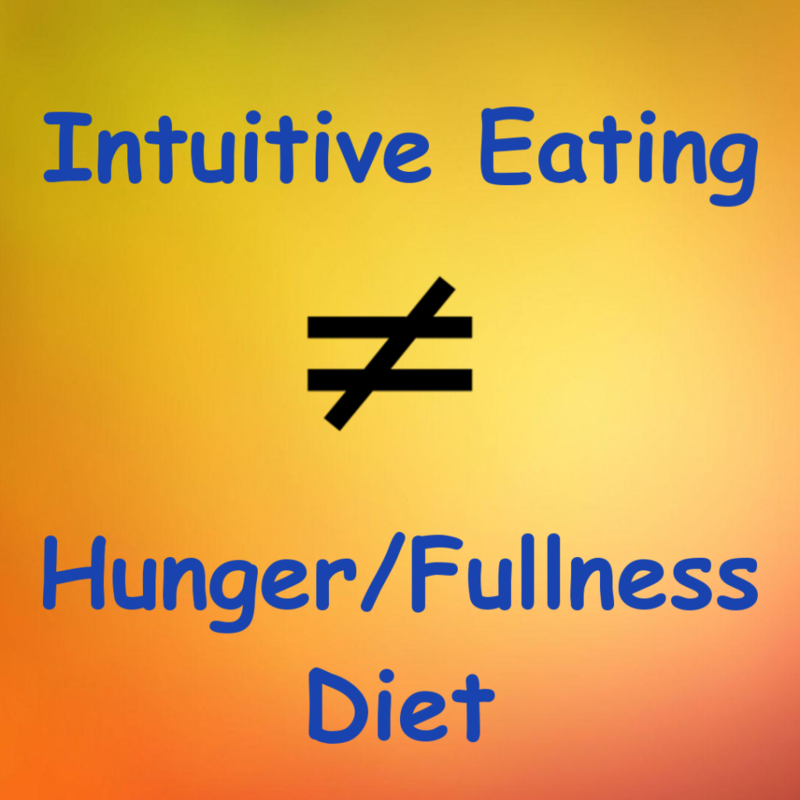 Intuitive eating did not become a diet for me because I learned to view it as a guideline rather than a set of rules. Diets have rules; intuitive eating does not. Dieting had become like an old friend that I wanted to keep in my life, but I had to put my physical and mental health first. In order to move forward, we had to part ways. Though there were times I wanted to give up and slip back into my old dieting habits, saying goodbye was the right choice. Did you ever try to make intuitive eating into the hunger/fullness diet? Please share in the comment section below. 1Safety first though! I’m actually more of a rule breaker than a reckless driver. 2And being forced into anything is not intuitive! 3Read more about this in “What Is This Intuitive Eating You Speak Of?” It was my very first blog post! 4Spoiler alert! It does get easier with time. 5Captain Barbossa knows all about this! This hits me hard. I never thought that what I was doing was turning IE into a HF diet, but of course that’s exactly what I’ve been doing. I’m still holding onto so many of my old, old habits. Recently was suggested to take one principle at a time. Think I’m headed back to square one! Please don’t be hard on yourself! It’s tough going from a dieting approach to not. And I don’t think you’re back at square one. You’re at least at square 1.5 since you now are aware of your tendency to turn IE into the H/F diet. You got this!